The heart of the instrument is a miniature infrared analyzer with exceptional stability, low maintenance, and a linear output. The heated measurement cell prevents water condensation. The SensorPod, which contains the infrared measurement cell, attaches to the front panel by a 1.5m cable. This cell can be removed for cleaning, inspection, or replacement in minutes. The digital display shows CO2 concentration in percent or mmHg, and allows breath-by-breath peak end-tidal reading or continuous rapid response. Calibration is performed with a single calibrated gas and room air. The reliability and ease of operation of the CapStar-100 make it the perfect instrument for routine respiratory CO2 monitoring. It is the natural companion to our SAR-830 series Small Animal Ventilators for monitoring respiratory status. With the AVS-1 Advanced Ventilator System, it can control end-tidal CO2. It can also be used to monitor unassisted animals. Gas sampling rates of less than 30ml/min can be used, making it possible to monitor animals as small as rats. 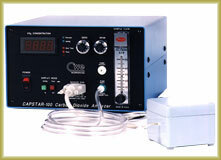 The fast response time of the CapStar-100 allows end-tidal response plateaus with respiratory rates of 100 breaths/min. A range of accessories is available to ensure easy setup and convenient operation. An accessory pack containing sample tubing, moisture traps, and Nafion® moisture-absorbing sample tubes is included with the instrument.